This agreement is designed for the lease of a doctor's office in a multi-tenant medical office building. 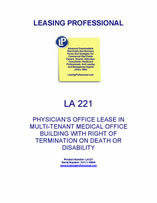 The lease provides for a tenant termination right if the physician tenant dies or is disabled. Landlord hereby leases to Tenant and Tenant hereby leases from Landlord Suite No. ___ on the ____ floor, containing ____ gross rentable square feet ("Premises") in the building located at _________________ ("Building") for the term and upon the conditions and agreements hereinafter set forth ("Lease"). This Lease shall constitute a binding agreement between the parties effective as of the date set forth above, which shall be added by either Landlord or Tenant, whichever party is last to sign the Lease ("Effective Date"). The term of this lease shall begin on the "Commencement Date" (Commencement Date being defined as the date Tenant occupies the Premises which shall be __________) and shall terminate ____ years thereafter on _________________ ("Term"). "Lease Year" shall be defined as each 365 consecutive day period throughout the Term, beginning on the Commencement Date. If the Premises are occupied for a fraction of a month at the beginning or the end of the Term, Tenant shall pay a proportionate part of the applicable monthly installment. (3) any other sums owed by Tenant in connection with Tenant's occupancy of the Premises, including, but not limited to, the cost of collection and disposal of any wastes generated at the Premises, and Tenant’s share of Real Estate Taxes as provided below. For purposes of this Lease, Base Rent and Additional Rent shall hereinafter be collectively referred to as "Rent". Tenant shall use and occupy the Premises as a medical office exclusively for Tenant's practice of medicine and for no other purpose. Tenant shall not use or occupy the Premises in violation of law or of the Certificate of Use or Occupancy issued for the Building of which the premises are a part and shall immediately discontinue any use of the Premises which is declared by either any governmental authority having jurisdiction or the Landlord to be a violation of any law, code, regulation or a violation of said Certificate of Use of occupancy. Tenant shall comply with any direction of any governmental authority having jurisdiction which shall, by reason of the nature of Tenant's use or occupancy of the Premises, impose any duty upon Tenant or Landlord with respect to the Premises or with respect to the use or occupation thereof. Tenant shall not do nor permit to be done anything which will invalidate or increase the cost of any fire an extended coverage insurance policy covering the building and/or property located therein, and shall comply with all rules, orders, regulations and requirements of the appropriate Fire Rating Bureau or any other organization performing a similar function. Tenant shall promptly upon demand reimburse Landlord for any additional premium charged of such policy by reason of Tenant's failure to comply with the provisions of this paragraph. Tenant shall not do or permit anything to be done in, on or about the Premises which would in any way obstruct or interfere with the rights of the tenants or occupants of the Building, or use or allow the Premises to be used for any immortal, unlawful or objectionable purpose, nor shall Tenant maintain or permit any nuisance or commit or suffer to be committed any waste in, on or about the Premises. Tenant shall not dispense any drugs or medicines to persons other than Tenant's own patients. In the practice of medicine at the Premises, Tenant shall have the right to perform only such laboratory tests and diagnostic procedures which are ancillary and incidental to the care and treatment of Tenant's patients, and not for third parties or for an independent profit motive. Prior to the installation and use of any diagnostic, laboratory or radiology equipment, Tenant shall provide Landlord with a list of such equipment and its intended use, a list of any hazardous substances, wastes or materials, as hereinafter defined, which will be used or generated in connection with such laboratory and/or diagnostic tests; and Tenant's proposed procedures for the use, storage and disposal of any hazardous substances, wastes or materials, including but not limited to the procedure for silver recovery for any radiology equipment. Tenant shall not cause or permit the release or disposal of any hazardous substances, wastes or materials, or any medical, special or infectious wastes, on or about the Premises or the Building of which they are a part. Hazardous substances, wastes or materials shall include those which are defined in the Comprehensive Environmental Response, Compensation and Liability Act of 1980, as amended, 42 USC Section 9601 et seq; the Resource Conservation and Recovery Act, as amended, 42 USC Section 6901 et seq; the Toxic Substances Control Act, as amended, 15 USC Section 2601 et seq; and medical, special or infectious wastes shall include those which are defined pursuant to the medical waste regulations which have been promulgated by the state in which the Premises are located, and as further set forth in any state or local laws and ordinances, and their corresponding regulations. Tenant shall comply with all rules and policies set by Landlord, and with all federal, state and local laws, regulations and ordinances which govern the use, storage, handling and disposal of hazardous substances, wastes or materials and medical, special or infectious wastes. Tenant shall indemnify, defend and hold Landlord harmless from and against any claims or liability arising out of or connected with Tenant's failure to comply with the terms of this Article IV, which terms shall survive the expiration or earlier termination of this Lease. Landlord, may at its option, terminate this Lease in the event Tenant engages in a prohibited use and fails to cure such violation within thirty (30) days following Tenant's receipt of written notice form Landlord. (1) All utilities for the Premises which are not separately metered as well as all utilities for the common areas of the Building and maintenance services will be paid for by Landlord. Heat and air-conditioning required to be furnished by Landlord will be furnished whenever the same shall, in Landlord's reasonable judgment, be required for Tenant's comfortable use and occupancy of the Premises during reasonable business hours. If Tenant requires or utilizes more water or electric power than is considered reasonable or normal by Landlord, Landlord may reasonably determine and require Tenant to pay as Additional Rent, the cost incurred as a result of such additional usage ("Surcharge"). Tenant agrees to pay all separately metered utilities required and used by Tenant in the Premises. Landlord reserves the privilege of stopping any or all of such services in case of accident or breakdown, or for the purpose of making alterations, repairs or improvements, and shall not be liable for the failure to furnish or delay in furnishing any or all of such services when same is caused by or is the result of strikes, labor disputes, labor, fuel or material scarcity, or governmental or other lawful regulations or requirements, or the failure of any corporation, firm or person with whom the Landlord may contract for any such service, or for any service incident thereto, to furnish same, or is due to any cause other than the gross negligence of the Landlord; and the failure to furnish any of such services in such event shall not be deemed or construed as an eviction or relieve Tenant from the performance of any of the obligations imposed upon Tenant by this Lease. Landlord shall not be responsible to the Tenant for loss of property in or from the Premises, or for any damage done to furniture, furnishings or effects therein, however occurring, except where such damages occur through the gross negligence of Landlord; nor shall Landlord be responsible should any equipment or machinery break down or for any cause cease to function properly on account of any such interruption of service. Tenant shall be solely responsible for and shall promptly pay all charges for telephone and other communication services. (2) At all times during the initial Term or any extension thereof, Landlord, at no cost or expense to Tenant, shall promptly and in a workmanlike manner perform all maintenance and make all repairs and replacements required, in the opinion of Landlord, to keep the Premises and the Building in good order, condition and repair, except if the need for such maintenance, repairs or replacements is caused by the fault or negligence of Tenant (reasonable wear and tear excepted), in which event Landlord will perform the maintenance, repairs or replacements required and charge Tenant therefore, such changes being due in full upon tenant being billed for same.